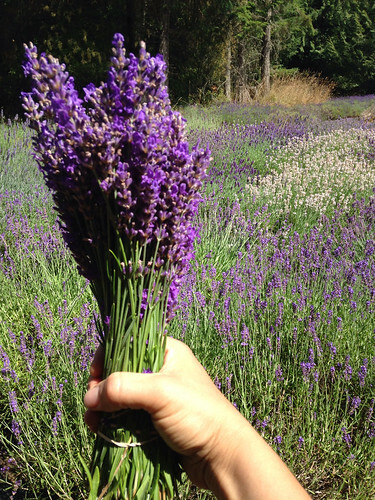 Last month I had the pleasure and honour to witness (and micro-participate) in lavender harvest at an organic lavender farm on Saltspring Island, BC. No amount of photographs of lavender field in full bloom could have prepared me for the tremendous multi-sensory beauty that they bestow upon those who visit them in person. 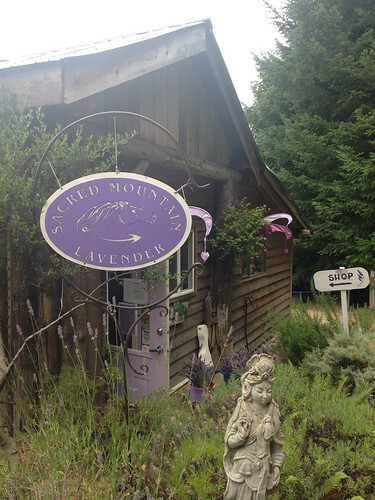 This summer I had the pleasure and privilege to witness and micro-participate in the lavender harvest and distillation at Sacred Mountain Lavender Farm. Nothing could have prepared me for how wonderful the aroma of hundreds of lavender shrubs simultaneously blooming would be. It's an all-immersing experience that is hard to describe in words. Everything about those bushes - stems, leaves, buds and petals - contributes to a whole experience of a living, breathing lavender, the reassuring presence of the essential oil content, like a whiff at a lavender sachet in one's linen closet, promising a good night's sleep; and the smell of wet twigs and coumarin that emanates from the rest of the plant. I won't lie to you: it smelled quite familiar, like a rich green, paste-like lavender absolute, or an all-natural Fougère fragrance which would at least have some lavender absolute. The fields, even though relatively small in size (only 2 acres), stretch upon the hillsides of sacred Mount Tuam, and create a very impressive view of Mediterranean-azure against the natural habitat of Canadian. They really are more blue than any other lavender I've ever seen. So saturated with colour, they are almost fluorescent. Nothing like the dull greyish-purple I've been accustomed to seeing. As expected, the lavender grows in neat rows of puffy blue shrubs, with plenty of space between the rows to stroll around and tend to the plants. The earth between them lined with black sheets to conserve moisture (a most important thing especially with the drought this year!). Another pleasant surprise: As you walk through the rows, golden honeybees are abuzz on every step you take. They are very friendly, and won't disturb your harvest as long as you don't squish them. It was such a rejuvenating experience, that even my daughter, who usually gets rather puzzled and distressed about any agricultural tasks, knew exactly what to do and walked herself gracefully around the bees and made a beautiful lavender bundle all of her own. This farm grows 60 varieties of lavender in their educational demonstration plots, including some less known cultivars, such as a "Melissa" white lavender, and Maillette. 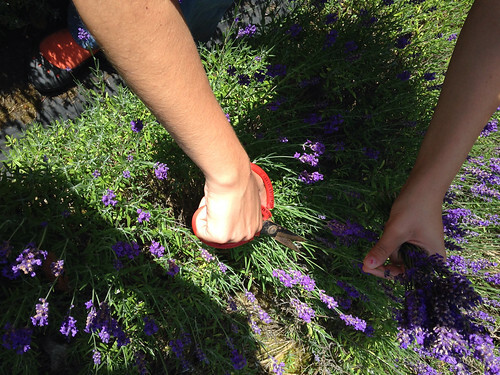 They had a "U Pick" which is how Miss T and I were able to scavenge the rows of buzzing angustifolia bushes (which they called "English Lavender" for some peculiar reason; their Lavandin, by the way, was called "French"). To be perfectly accurate, this lavender is about as Canadian as could be. 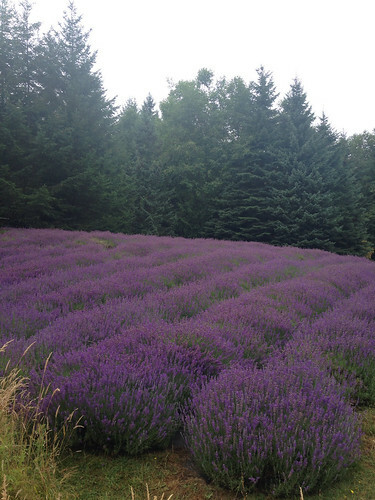 And I'd also like to mention: this is not the first lavender farm I've come across. There was one in Quebec near my dad's country house; there's one I heard about in the Okanagan near Osoyoos, and there is also the Montrose Family Farm nearby on Bowen Island, who comes to the market every August with their lavender bouquets, sachets and handmade wands which they weave on the spot. What's unique about this farm is that they are fully dedicated to lavender and also distill the oil and hydrosol on the spot. 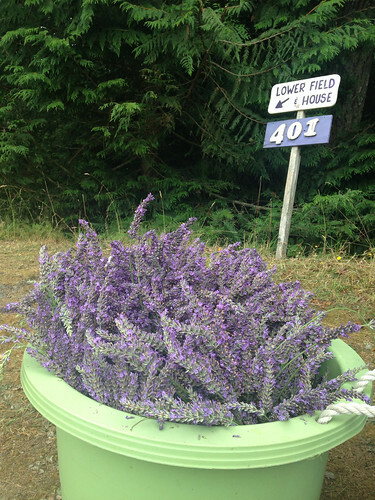 Every year in mid-July they hold a Lavender Festival to commence the lavender harvest season (which normally lasts between July 20 - September 1), and I was lucky to be visiting Salt Spring Island with my mom exactly that weekend. They had live concerts and dance performances, and this year they had an Italian theme so most of the music was arias from Italian operas, and an Italian chef created an entire menu using fresh lavender flowers from the farm - there was pasta with peas, fresh mozzarella, lavender and basil; pizza with eggplant and lavender, and a Sicilian ricotta pie that was on the drier side (a little like a bar with a shortbread-like crust on the bottom and top), and had a ricotta filling dotted with candied lemon peel and the non traditional addition of lavender, of course. There was a distillation demonstration for a couple of hours, in which you could see how they separate the buds from the branches (after they dry them) for filling sachets, etc. 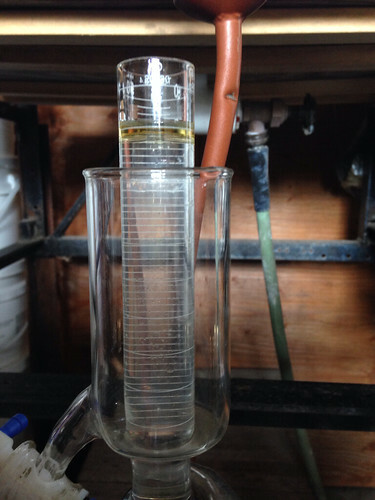 ); and also how the freshly harvested lavender is being fed to the still and see a little bit of the oil forming on top of the water (see below). The yield at the farm is about 0.4%-0.5% oil to fresh plant matter in lavender (L. angustifolia), which means you'll need between 200-250 lb of lavender to make only 1 lb of lavender essential oil and 1% for lavandin (L. latifolia), which will require 100 lb to produce 1 lb of lavandin oil. This is low in comparison to a good lavender yield (110 lb to produce 1 lb of oil - which is about 0.9%) and even lower than an average one (150 lb, or 0.66%). I'm guessing there could be a few reasons for that, one being the climate, which is perhaps Mediterranean in Canadian terms; but rather not in Mediterranean terms. No matter how you slice it, the sun pattern is not the same on the 49th parallel as it is at the 43rd (where the Maritimes-Alpes in France are, for example); and moreover, even if there is less rain on Salt Spring than in the rest of the Lower Mainland - it's still plenty of rain, even in a drought year like this year. But more important is the terroir, and in particular the altitude. The farm is situated just a little above sea level. However, lavender that grows in high altitudes not only produces more esters, but also more of them make it to the finished product. The reason is, that in high altitudes, the boiling point of water lowers down to 93c. Therefore, the oils can get produced at a lower temperature, and without destroying as much as the delicate components (such as esters). 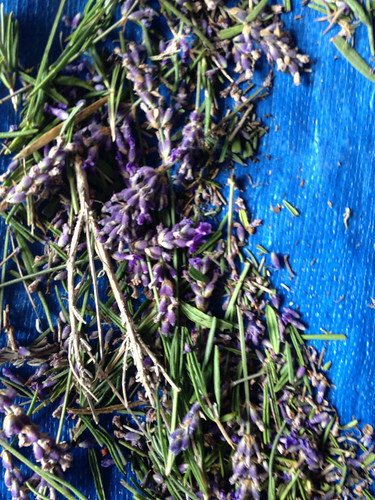 This is the two-fold reason why lavender grown in high altitude has a superior quality. 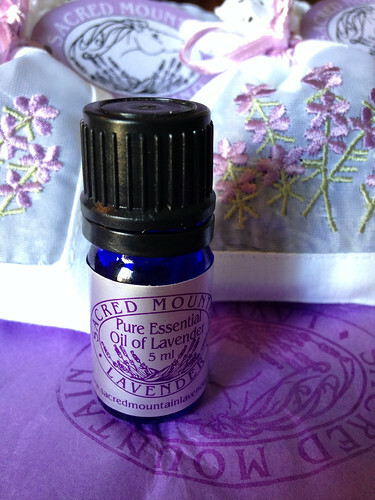 Nevertheless, the oil at Sacred Mountain Lavender Farm is quite lovely, with hints of an almost chocolate-like sweetness. At the farm's shop you can get all their locally made lavender products, including lavender and lavandin essential oils and hydrosols, body butters and creams, culinary lavender products (herbal blends, lavender-scented teas and tisanes, etc. ), and of course - lavender sachets. 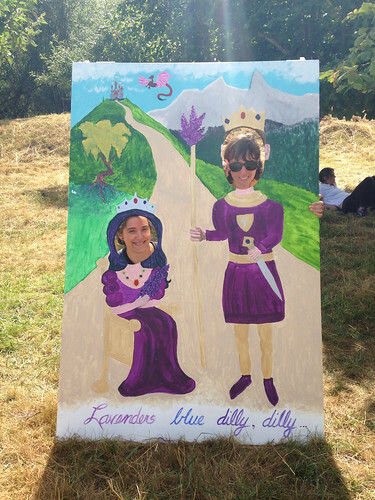 Miss T and I are the king and queen of lavender, at least for the photo! Sounds absolutely wondrous. You are so lucky to have had this experience; I had a dream of something like this not too many weeks ago, where I went on a trip to a shimmering meadow on a bright, crisp day somewhere in the north of England and watched them 'take perfume' from the lavender. I truly want to have a real-life experience of it myself one day. 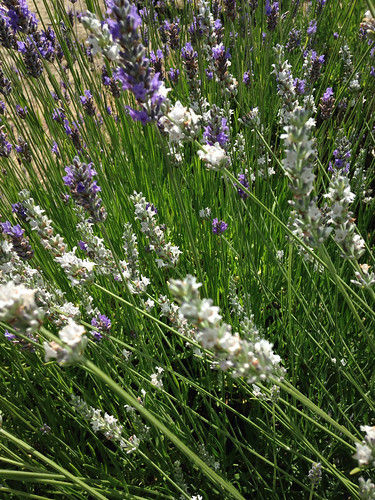 Lavender has been such an integral part of my upbringing and home. WOW! I must visit this place when I visit BC in the future. I imagine August must be a beautiful month weather-wise in BC, and to see the fields. Is it a day trip or worth staying a night in the town? Looks lovely! Thanks for the interesting post. Neyon - not sure where you live, but lavender is grown all over the world. I'm quite sure that there is a farm somewhere nearby where you live, and now would be the time they harvest it. Anon - Salt Spring Island is a beautiful place to visit, year around. It's about 3-4hrs trip from the mainland, so I'd say at least stay there for two days while there. They have a farmers market in Ganges in the summer, also with artisans, and there are many artists and galleries all over the island that you can probably visit too, beautiful parks, lakes and beaches. The view from Mt. Maxwell is breathtaking! In England, and yep, in the Cotswolds and in the south too but they're in two extremities from my town. I plan on going one day, for a whole experience up in the north and probably to stay for a good few days. Though lavender is grown in many places and we've always had lots in our garden, the varieties of lavender, different ones found in different parts of the world, is wonderful in terms of colour as well as essence. I feel that their blissful hues ranging from dusky purples to sunset pinks to soft lunar whites are a true reflection of their aroma - delicate, dreamy and profound.